From hair regeneration to new organs, from clones to the eradication of deadly infectious diseases: there is no end, we have been told, to the power of stem cells. Stem cell research has been some of the most controversial science the world has seen for the last 20+ years, and the number of clinics and medical professionals offering stem cell therapy has increased exponentially in D.C. and throughout the U.S. Stem cell therapy is still in its infant stages – but you might not know that from the miracles that healthcare professionals seem to promise every day. Because of this, many people have sustained serious, life-long injuries and harm at the hands of licensed doctors and unlicensed frauds. At Paulson & Nace, PLLC, we hold the negligent parties responsible when they commit acts of stem cell therapy malpractice. Our attorneys in Washington, DC and West Virginia will fight aggressively on your behalf, and seek justice for you and your family. The argument from stem cell researchers is that, if stem cells of any kind can be differentiated – like embryonic cells can – then science could conceivably create new organs, or wipe our diseases, or treat lasting injuries. How can stem cell therapy treat diseases and conditions? Theoretically, stem cells therapy can fix any problem. It can help burn victims create new, healthy skin. It could help traumatic brain injury victims overcome developmental delays or relearn skills. It could cure infected or defective organs, help diabetics create their own insulin, maybe even cure Parkinson’s, multiple sclerosis or heart disease. Are stem cells commonly used in any medical procedures? Stem cell therapy has become more commonplace, but it is still not a common form of treatment. The best-known therapies usually involve bone marrow or umbilical cord cells being used to help victims with life-threatening cancers, such as leukemia. It is worth noting that because of the incredible risks of the procedure, stem cell therapies are often a last result for patients whose immune systems have been virtually destroyed by other treatments. If you have opted to try stem cell therapy that was still in the experimental stage, but were told it was not, or we promised it would work, then you may be able to file a claim for medical malpractice. They claim there is no risk. Every medical procedure involves some level of risk, and stem cell therapies, which are largely experimental, are riskier than most. Claims are based on patient testimonials. Unless there is documented research and literature that indicates a specific treatment option has been successful, you should avoid it. Testimonials are not a reputable source. There is no documentation for where the cells come from. Everything in the medical field leaves a paper trail. If there is no clear documentation as to where the stem cells have come from, or if you are not presented with verified literature about the stem cells or about the procedure, or if you request such documentation and none is made available to you, then you could be setting yourself up for a serious injury or illness. Even if you are looking into clinical trials, there are protocols in place that are required under state and federal law. The clinic is claiming a “one cell fixes all” approach. There is no such thing as a miracle stem cell. The same type of stem cells will not cure macular degeneration and fix your burn scars. If the clinic or medical “professional” claims that only one type of cell is needed to cure your illness or injury, he or she is lying to you. Furthermore, differentiated cell treatments should be handled by different specialists. Your podiatrist may be excellent, but you wouldn’t want him to handle your open-heart surgery, right? The same is true for stem cell therapy. There are hidden or excessive fees. Clinical trials should not cost you money. Additionally, you should be informed of any additional costs that may be associated with your stem cell treatments before you consent to them – especially if you are paying out-of-pocket for the therapy. If you are thinking about participating in a clinical trial for stem cell therapy, the National Institutes of Health can provide you with a list of trials near you. A doctor/patient relationship existed between you and the healthcare professional in question. The doctor behaved in a way that was negligent or purposely malicious, thus breaching his or her duty of care. That negligent behavior/breach of duty caused the injury or illness you or your loved one developed. That injury or illness led to compensable damages, such as economic losses (time away from work, medical bills, etc.) or non-economic losses (pain and suffering, mental anguish, etc.). Thus, if you were promised that stem cell therapy could cure your MS, but all the “therapy” did was drain your bank account and expose you to increased chances of infection, you can and should speak to a DC medical malpractice lawyer about filing a claim or bringing a lawsuit against the doctor and potentially the clinic itself. 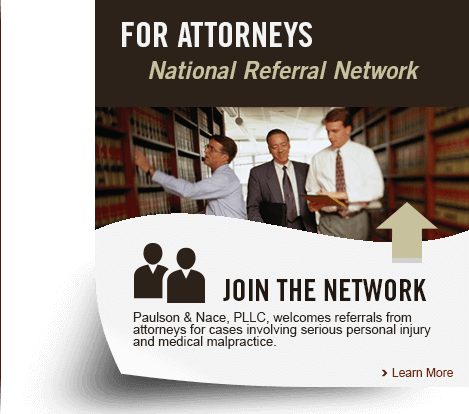 Paulson & Nace, PLLC is known throughout Washington, DC and West Virginia for handling complex litigation on behalf of injury and medical malpractice victims. If you have sustained an injury or illness while undergoing stem cell treatments, we want to help. Please call 202.930.0292, or fill out our contact form to learn more about our services.